In The New York Times' Dining Section today Sam Sifton appraises the latest outpost of the Bastianich-Batali empire. If you haven't yet visited Eataly, their Italian resto-megamart in the Flatiron District, the Pasticceria is a rewarding place to start. Torta di Nocciole di Costiglio. 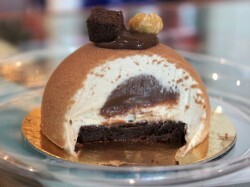 Strategize how you want to attack the orb-shaped flourless hazelnut cake ($4.80). It stands there like some dessert version of the monolith in 2001: A Space Odyssey. 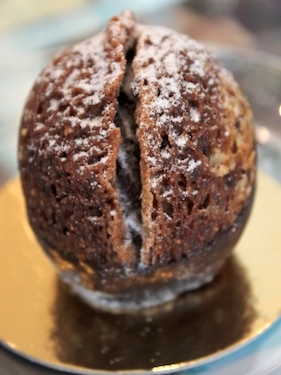 The Torta di Nocciole di Costiglio (below) has a crunchy hazelnut shell and smooth, fudgy chocolate in the middle— think super-sized Ferrero Rocher. Wonderful in between sips of bitter espresso. 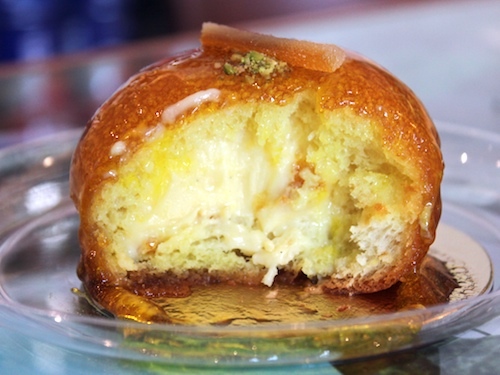 Cross-section of the Babà al Limoncello. The aerated cream in this white chocolate and hazelnut Bavarian cake is so super-smooth and light you wonder how it retains the dome. 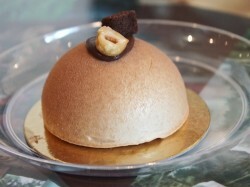 It has all the hazelnut flavor without the texture, concealing a thin chocolate sponge cake and white chocolate ganache at the center ($5.80). The Tiramisu su Torronato had Lidia all a-twitter. 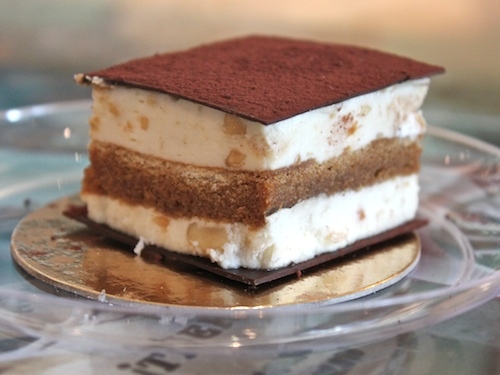 And with good reason— it’s a lovely tiramisu ($5.80). A layer of liqueur-soaked cake with more of that airy cream, here studded with hazelnuts, and on either end a thin sheet of dark chocolate. This Apple Tart ($4.80) was the only real fumble. 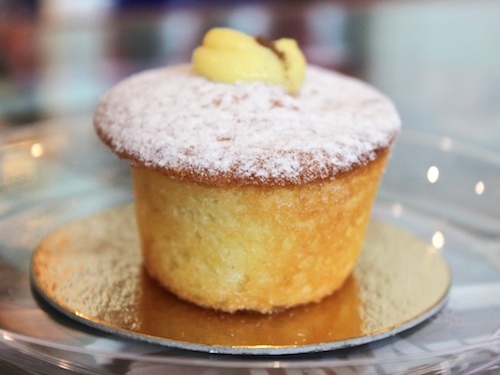 Don’t bite in expecting something akin to pound cake, this is more dry, with a soft-sablé kind of texture. The apple flavor is lacking too— hunt and you might find a few stray pieces. Hold out for another Babà or Diabella.